A phylogenetic tree is a branching diagram that represents the evolutionary relationships among closely-related organisms. The root of the phylogenetic tree represents the ancestor. The branching pattern of a phylogenetic tree reflects the evolution of several species from the common ancestor. The branching represents speciation. The tips of the phylogenetic tree move forward with the time. A phylogenetic tree can be read accurately if you know its features. 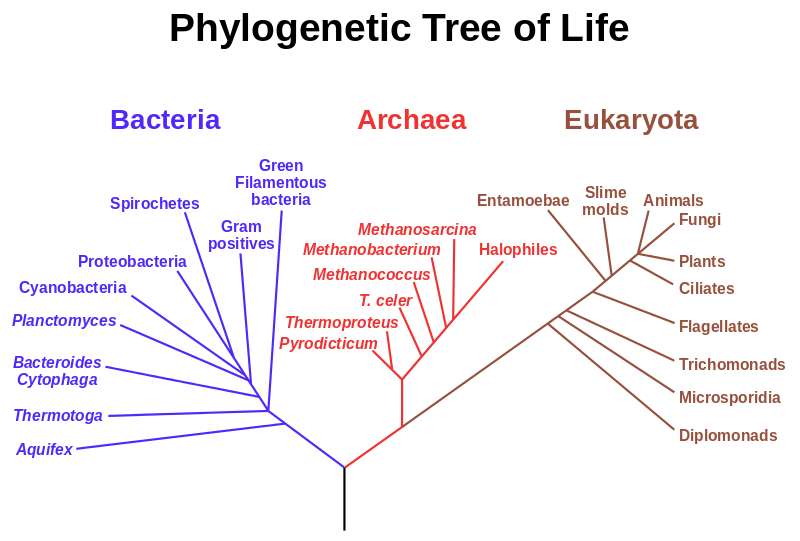 A phylogenetic tree is a branching diagram, showing the inferred relationship between various biological species. Several characteristics such as external morphology, internal anatomy, biochemical pathways, behavior, DNA and protein sequences, as well as the evidence of fossils are used during the generation of a phylogenetic tree. However, phylogenetic trees are hypotheses and do not indicate the exact relationships. The data obtained from DNA sequencing increases the reliability of the relationships in the tree. Phylogenetic tree of life is shown in figure 1. 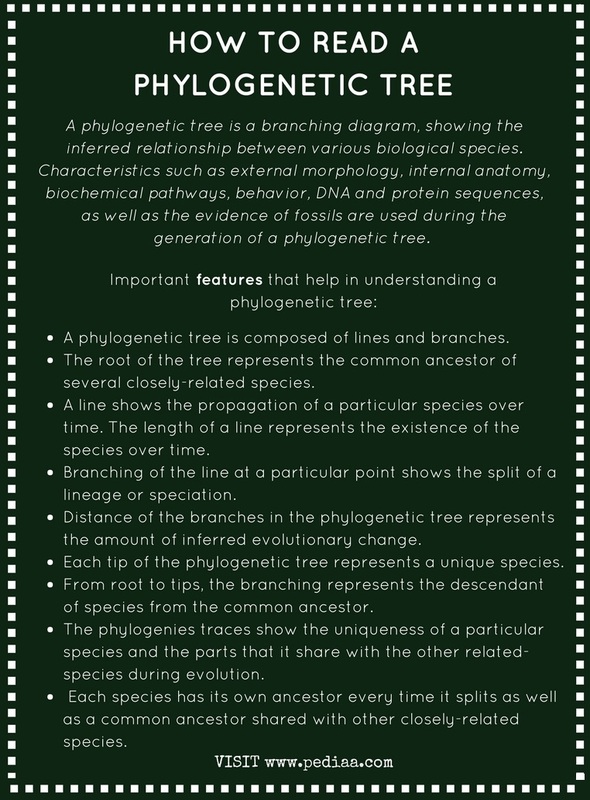 Important features that help in understanding a phylogenetic tree are described below. A phylogenetic tree is a branching diagram, showing the evolution of closely-related species from their ancestor. It is composed of lines and branches. The root of the tree represents the common ancestor of several closely-related species. A line shows the propagation of a particular species over time. The length of a line represents the existence of the species over time. The branching of the line at a particular point shows the split of a lineage or speciation. The distance of the branches in the phylogenetic tree represents the amount of inferred evolutionary change. Each tip of the phylogenetic tree represents a unique species. From root to tips, the branching represents the descendant of species from the common ancestor. The phylogenies traces show the uniqueness of a particular species and the parts that it share with the other related-species during evolution. Ultimately, each species has its own ancestor every time it splits; it also has a common ancestor shared with other closely-related species. A phylogenetic tree is a branching diagram that represents the evolution of species. The lines of a phylogenetic tree represent the existence of a particular species over time. The branching represents speciation. The root of the phylogenetic tree represents the common ancestor while the roots at each branching represent an ancestor of the newly-formed species. 1.“Understanding Phylogenies.” Understanding Evolution, Available here.